AFAIK, they can't do anything until 20/21 season without full agreement of all championship clubs because that's when current agreement runs to. Funny how it always seems to loose its aura when they have a shite year? 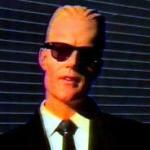 Not exactly a body with great internal locus of control is the old prem, always someone else's fault. It looks bad for them being beaten by Pro14 teams. They always like to portray the AP as being superior to the Pro14 but its a bit hard to do if results don't match the picture they paint. "That was shiterarse coaches need to look at themselves this is as bad at is.beem with school. 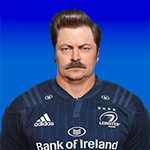 Items impeovrnkyb neefedc"
This, I'd be happy to see Edinburgh, Connacht and possibly Cardiff or maybe Zebre return and loose a few English teams if they don't feel up to it. Feel sorry for the English fans though most seem to enjoy euro days. The article is all over the place tbh. IF the problem is that the quality isn't there in the championship then bringing up 2 more teams isn't a like for like replacement for the HEC games. They'd be looking at a haircut on current income to go to 14 teams and ditch HEC income. In other news. the Saffer backers of Saracens are getting cold feet. McGeekhan had that very idea in the UK press a few weeks back. He made it sound like an original idea too! 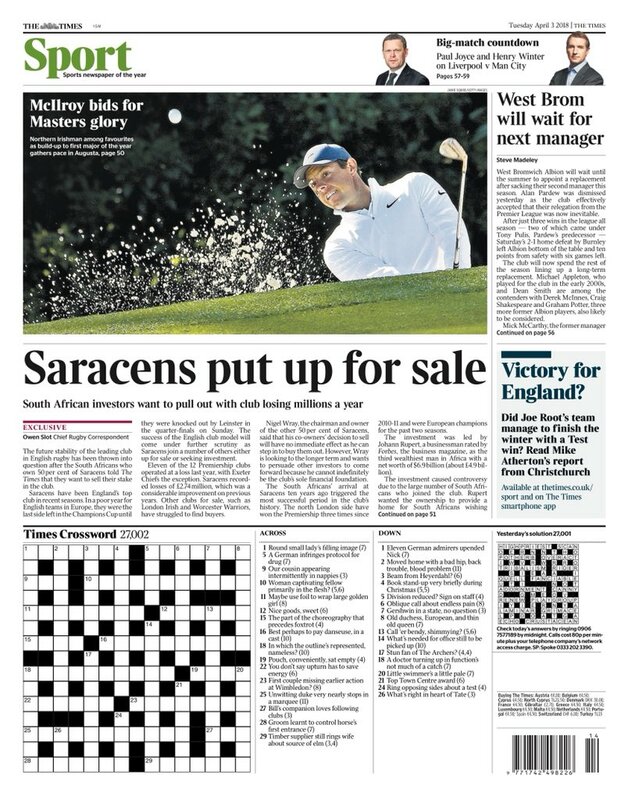 Saracens up for sale according to the Times. The Saffers might be looking at switching their money to Munster. 2013 through to 2017 Only 4 different teams appeared in the Heineken/ERCC final - Saracens (x3), Toulon (x3), Clermont (x3) and Racing (x1). I'll die before I surrender, Tim. I'm sure BT will be delighted to hear that the competition that PRL sold them has now "lost its aura". Last edited by Made Of Ale on April 3rd, 2018, 9:27 am, edited 1 time in total. Saracens story is this in some way a consequence of two Saffer teams joining the Pro14. The future stability of the leading club in English rugby has been thrown into question after the South Africans who own 50 per cent of Saracens told The Times that they want to sell their stake in the club. Saracens have been England’s top club in recent seasons. In a poor year for English teams in Europe, they were the last side left in the Champions Cup until they were knocked out by Leinster in the quarter-finals on Sunday. The success of the English club model will come under further scrutiny as Saracens join a number of others either up for sale or seeking investment. Eleven of the 12 Premiership clubs operated at a loss last year, with Exeter Chiefs the exception. Saracens recorded losses of £2.74 million, which was a considerable improvement on previous years. Other clubs for sale, such as London Irish and Worcester Warriors, have struggled to find buyers. Nigel Wray, the chairman and owner of the other 50 per cent of Saracens, said that his co-owners’ decision to sell will have no immediate effect as he can step in to buy them out. However, Wray is looking to the longer term and wants to persuade other investors to come forward because he cannot indefinitely be the club’s sole financial foundation. The South Africans’ arrival at Saracens ten years ago triggered the most successful period in the club’s history. The north London side have won the Premiership three times since 2010-11 and were European champions for the past two seasons. The investment was led by Johann Rupert, a businessman rated by Forbes, the business magazine, as the third wealthiest man in Africa with a net worth of $6.9 billion (about £4.9 billion). The investment caused controversy due to the large number of South Africans who joined the club. Rupert wanted the ownership to provide a home for South Africans wishing to play abroad and yet maintain their links with the Springboks. However, the players who came tended, instead, to be cut off from the Springbok system. Therefore, for two reasons, the original justification for the investment no longer holds: because the number of South Africans has dwindled and because of the continuing operating losses. When Rupert walks away, he will be writing off debts of about £25 million. However, it was not personal debts that have persuaded him to sell. The 50 per cent share is not owned by him but by a public company, Remgro, of which he is chairman and a 7 per cent shareholder. The club management has always been more closely operated by Wray. “The club is really Nigel’s baby and everyone knows that,” Rupert said. It therefore seems to make sense for Wray to buy back the 50 per cent that he sold to Remgro ten years ago. The South Africans may retain a smaller stake, though Wray has indicated that he could go back up to a short-term holding of 100 per cent. The club are looking for two backers. One would be a property investor to help to finance the rebuilding of the west stand at Allianz Park, the club’s ground in north London. The intention is that the new west stand will generate its own income, some of which would offset the club’s losses. That would make it a more attractive investment for a second (or more) investor(s). The Saracens ownership comes under the name of a holding company, Premier Team Holdings, whose losses in the past four financial years were £5.31 million, £3.99 million, £3.27 million and £2.74 million. The intention, with money generated by the new west stand, is that the losses will shrink to the point where the club will start to break even. The question for Saracens is therefore twofold: will they be able to find a new buyer? And, until they do, is Wray happy to continue covering the losses required to keep a squad that can compete at the top of the game together? For now at least, Wray insists that he will stand by the club that he has done so much to build. Based on the table of losses above, Munster are doing too badly. I remember checking Saracens company records a few years ago and most of the charges listed were unsecured loans so if any of them pull out they basically walk away from those loans and Wray does not even have to buy them out. It has always been very dubious how the entire circus has been funded by a myriad of funds and companies. Would you sign a deal with PRL? Not worth the paper it would be written on. Kitson shouldn't get Welsh hopes up like that. That was a zinger of such potency it woke me up!